Last week I shared my scary BIG goals with you and had some tips on how to actually achieve your goals this year. 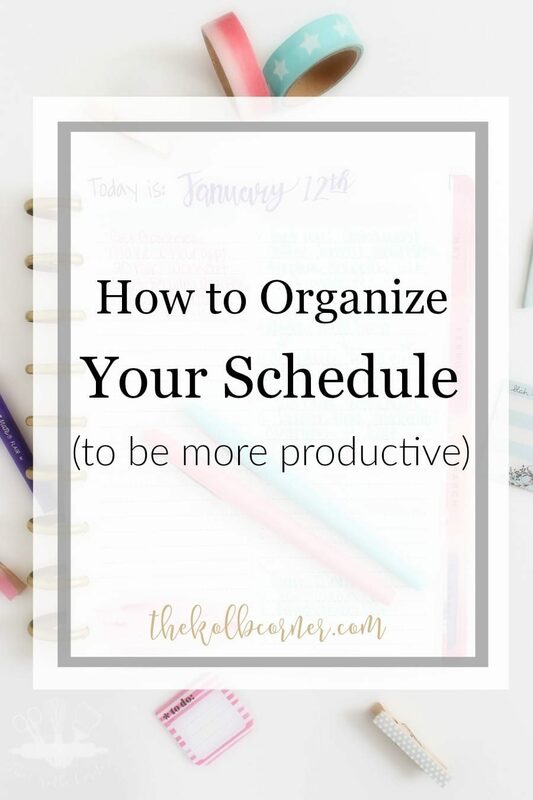 Today, I’m going to let you in on a few tips I’ve learned the last few years for how to organize your schedule to be more productive every day. I am a pen and paper girl. From to-do lists, grocery lists and meal plans, to weekly/daily schedules and cleaning tasks, I LOVE writing things down. Writing it down sort of engraves whatever it is in my mind and that makes me stick to it better than just typing it up somewhere. 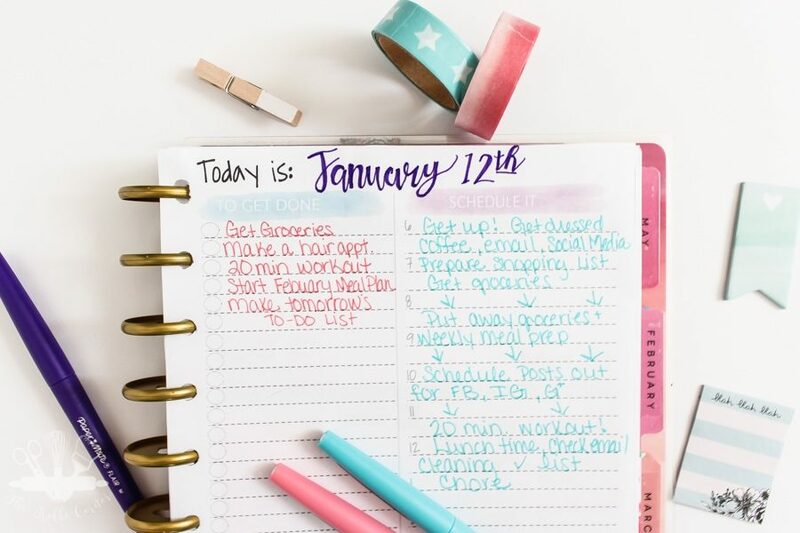 One of my favorite tools to help me keep my daily schedule and to-do lists organized is my Happy Planner. I have always used a monthly/weekly planner of some sort, but this year I decided to go with the Happy Planner. 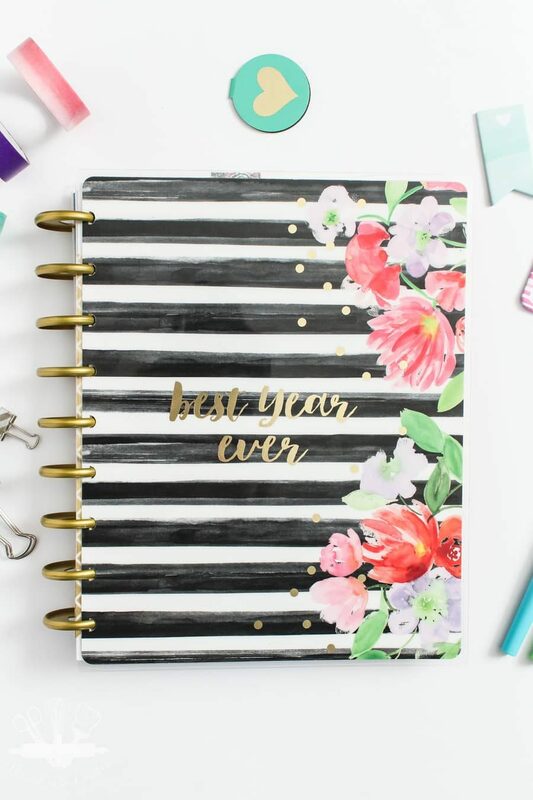 What I love most about this planner is that I can really customize it anyway I want with inserts, and I can get new monthly/weekly pages when the year is over. 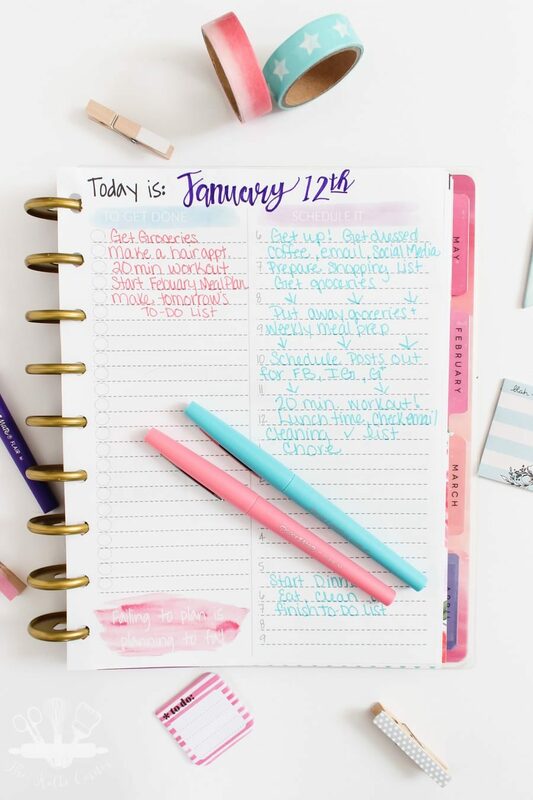 But, even if you have a planner you still need to organize your entire daily schedule so you can maximize your productivity. Simply writing a to-do list doesn’t cut it! With that in mind, here are some actionable steps for you to take to learn how to organize your schedule. 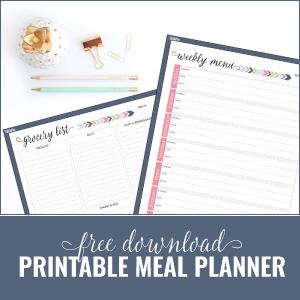 Download your free daily schedule printable (includes Happy Planner Classic Size) by subscribing to my weekly newsletter. You’ll gain access to all of my member only exclusive printables and be the first to know when I add new ones! Yes, I did just say that making a to-do list doesn’t cut it. That’s because it is only one step to organizing your schedule! Making a to-do list gets everything floating around in your head out onto paper. The biggest mistake I make is telling myself I will remember to do something and that I don’t need to write it down. If you write it down, you can’t forget it! Unless you lose the to-do list– don’t do that. Time-blocking is something I started doing over a year ago when I went from working a full-time job to a part-time job. I wanted to make sure that my extra days spent at home were utilized to their fullest. I came up with a daily schedule for the things that I had to get done and then used the open slots to get blog work finished. My normal hours were 6am to 10pm. I simply filled each task into the appropriate time slot, even including a time for coffee 🙂 Since I work from home blogging full time now, my schedule does change day to day. 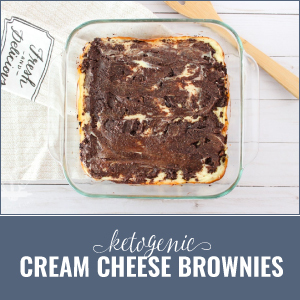 I have set specific days I go to the store, do blog auditing or meal plan etc. Alotting a time frame for each task helps me get a look at the whole day. Plus, I know exactly what I should be doing and when I should be doing it! If you want your own free daily schedule printable, simply click the link below to download. I’ve even included a happy planner classic size for those of you that use one. This is crucial for me to stick to my time-block schedule. I will set a timer for however long I have allotted myself for a specific task, and when the timer goes off, I move on. I do this even if I haven’t finished the task I was working on. This doesn’t happen often, but if there is something I wasn’t able to finish, I will usually work on it at the end of the day after dinner. Setting a timer for cleaning tasks, especially laundry, helps keep me from getting distracted too. I used to put a load of laundry in the washer first thing in the morning and then forget about it until after dinner time. With a timer set, I don’t forget. Shut down Social Media, Email and alerts on your Phone. I have found that I am much more productive while I am working if I close the tabs for my email, facebook etc. I have even turned off push notifications on my phone because they are so distracting. This way I can focus 100% of my attention the task at hand. It doesn’t mean that I never check facebook or email, I just try not to while I am working. I have specific times of the day that I check them and try to only do so then. If you aren’t a pen and paper kind of person, then these apps will definitely help you keep things organized but still digital. 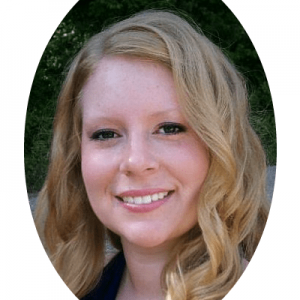 Google Calendar is a popular app for bloggers and other entrepreneurs, and my husband and I use it as well. We have a family calendar that we keep updated for events, birthdays, appointments etc. It’s very easy to use, and you can have it on your phone as well so that it’s always handy. Another app we use is called Trello. With Trello, you can create different boards with To-Do lists, create “teams” to share lists with and track things that have been completed. 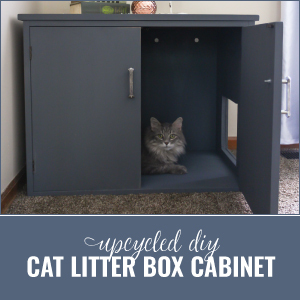 My husband and I use it to keep a running list of things that we need to do around the house, things we are out of, appointments to schedule and anything else we can come up with. Either of us can add, change, or delete items on the boards from our phones. I also really like the app 30/30. You create a list of items to get done, and allot a certain amount of time to get them done. The app automatically starts counting down when you start a task, and will keep moving down the line until you are out of tasks. You can color code, add icons, and change up the list with just a swipe of your finger. Any.do is another fun app you can use to keep your to-do list handy all the time. In the past I’ve used it for making grocery lists, or keeping a cleaning task schedule. You can even connect it to Amazon’s Alexa. Now that you know how to organize your schedule and the steps to take, get out there and start doing! Great information! I’m pretty sure I’m pushing Google Calendar to it’s limits 😀 I’m using it for the first time really and have many different calendars for different things I need to accomplish. My problem is definitely social media. By the time I realize it, I’ve been on it for far too long and am well passed my stopping point for what I was supposed to be working on. I think I’ll incorporate the timer idea. Thanks! Pinning! Yes, social media and email really get me distracted! And when I am supposed to be scheduling to social media, if I don’t have a timer before I know it half the day is gone 🙂 Try it girl! It will change you! That was a problem for me too, because I use Facebook for my business. I decided to take a break from Facebook , by making a personal commitment to respond to my notifications! It’s working, I have more time and no more scrolling!!!! Great tips! I am THE WORST about making my to-do list and then never looking at it again. Haha, that doesn’t do much for productivity! Jessica I was the same way! I would even make to do lists for my to do lists and then tuck them away in a drawer never to be seen again lol. Working this way has helped me SO much! I think my hardest part of my schedule are distractions. During the summer with all the kids home I’m finding myself pulled in all directions and I need to get better at blocking that out. I think schedule blocking does help a lot. Time blocking does help a lot! But I’m sure having the kids home is a huge distraction!